You must make this delicious Fresh Tomato Soup every summer, using tomatoes from your garden or the Farmer's Market. There is nothing like soup made from vine ripened tomatoes that are still warm from the sun. This tastes nothing like the canned tomato soup of your childhood! This soup does freeze well, too, so make it in the summer, freeze in 2 or 4-cup portions, and enjoy it in the dead of winter. 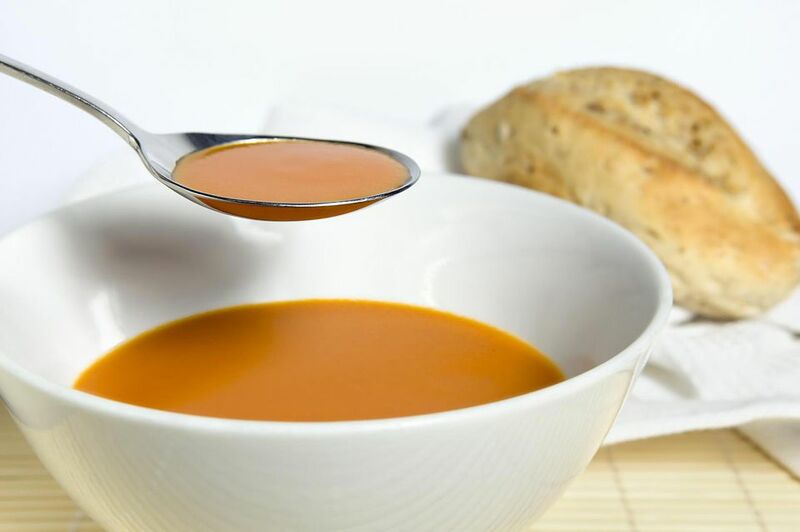 To heat, let it thaw overnight in the fridge, then place in a saucepan and gently heat, stirring frequently, until the soup reaches 160°F on a food thermometer. Serve with some homemade scones or some toasted garlic bread. A nice green salad, tossed with sliced mushrooms and some tiny peas, would be a good addition to this simple meal. 1. In heavy saucepan, heat oil and cook onions and garlic until tender. 2. Add both kinds of tomatoes, salt, pepper, and stock, and simmer for 20 minutes. 3. Strain soup through a fine strainer; discard the solids. 4. In clean saucepan, melt butter and add flour; cook and stir for 2-3 minutes to make a roux to thicken the soup. 5. Add 1/2 cup of the tomato mixture; cook and stir until thickened. 6. Add remaining tomato mixture and cook and stir with wire whisk until mixture is hot and slightly thickened. Stir in orange zest, basil, and thyme leaves, and serve.